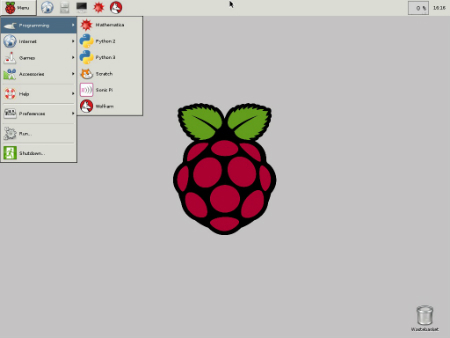 To make the Raspberry Pi desktop appear, type startx and press Enter when the dollar sign appears after you power up the Pi and log in with Pi as the username and “raspberry” as the password. 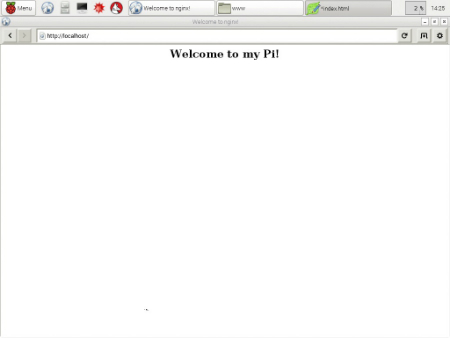 The Pi loads its desktop app — this takes a while — and eventually you see the screen shown in the following figure. You can now click around with your mouse, open, drag, resize and close windows, launch apps, and do all the things you usually do on a desktop. The taskbar is the area with the clock, the icons, the menu, and the graph thing with a percentage. On the old desktop, the taskbar is at the bottom of the screen. On the new desktop, it’s at the top. The old desktop has a few icons floating on it. On the new desktop, the background area has the Trashcan icon, and nothing else. When you open a window, it floats over the desktop area. You can drag the window around, resize it, and do all the usual things to it. To drag a window, click the colored area at the top with the name and/or description. It’s called the title bar because it looks like a bar and it has a title. You can click any window edge and drag it. You also can click a window bigger or smaller by clicking the bottom right corner. The top right of the window has three small buttons. In order, they hide the window, make the window fill the screen, and close the window. Sometimes closing a window quits an app. If an app has more than one window — some do, others don’t — you need to use File→Quit to quit. When you open a window, the desktop creates a tab in the taskbar. When you hide a window, the tab stays in the taskbar so that you can click it to show the window again. The following figure shows a desktop with a handful of windows and tabs. All the windows are hidden, except one. It’s called a desktop because windows are supposed to work a bit like sheets of paper on a real wooden desk. Of course, you can’t drag the corner of paper to make it bigger or smaller. And you can’t run apps on paper. And you can’t minimize paper to hide it. But apart from that, it’s a bit like pushing paper on a real desk. Click on the Taskbar menu, and you can see submenus with all kinds of apps and features. If you’ve used the desktop on a Windows PC or a Mac, you can probably guess what some of them do. The taskbar also has quick launch icons. They get special treatment. Icons in the desktop area are often hidden behind open windows, which makes them hard to use, but you can always see the quick launch icons. You need to know how to use the first three items in the list to get the most value from the Pi’s desktop. The last two items are for older Pi users who need help with high school and college math.